The Arc Minnesota in September launched its search for a new chief executive officer. The new leader will replace Kim Keprios, who stepped down in June. The firm of Ballinger Leafblad is helping the agency’s board of directors with the search. The Arc has been through many changes in recent months, as seven independent chapters across the state were merged into one entity. The Arc Minnesota and Arc Twin Cities were Keprios’ employer for the past 36 years. In a statement she described those years as “rewarding, humbling, joyful and challenging.” Keprios joined The Arc Hennepin County in 1982 and became executive director in 1986. She became chief executive officer of The Arc Greater Twin Cities in 2006 as metro chapters merged and was named CEO of The Arc Minnesota following the merger of statewide chapters on January 1, 2018. Keprios was a recognized leader at the local, state and national level, both within The Arc and in her community engagement with partner agencies, public and private sectors. She initiated innovative programs and services that have been vital to people with disabilities and their families. The Arc Minnesota Board expressed gratitude for Keprios’ commitment to the agency’s mission and her years of service. She has advanced many initiatives to improve the lives of people with intellectual and developmental disabilities and their families, and has been a vocal advocate for community inclusion. She was also a leader in the efforts to merge the chapters. The Arc Minnesota Chief Marketing Officer Rich Stoebe is serving as interim leader. September was Hydrocephalus Awareness Month which honors the estimated one million Americans touched by hydrocephalus. Hydrocephalus is a condition that affects both people and animals worldwide by preventing cerebrospinal fluid from freely flowing in the “lakes, creeks and rivers” inside the head causing difficulties such as headaches, impaired vision and cognitive issues. Minneapolis author Lesli Chinnock Anderson received her own diagnosis of hydrocephalus at the age of 45 after suffering from headaches and migraines her whole life. Her new medical memoir, The Lakes in My Head: Paddling an Unexplored Wilderness, chronicles her voyage of hope and healing after receiving this life-changing diagnosis and having a shunt surgically placed in her brain to help drain the excess cerebrospinal fluid. Anderson is sharing her story to be used as a source of inspiration and encouragement for those struggling with hydrocephalus and other conditions and challenging life events. diagnosis – to help readers not familiar with the condition better understand the “lakes in their heads” and the experience one goes through while trying to balance everyday life while dealing with a serious medical condition. To learn more visit, www.lesliandersonbooks.com. When he lost his sight as a result of a violent beating in 2007, St. Louis Park resident Belo Cipriani suddenly found himself thrust into a scary new world he didn’t know how to navigate. At the age of 26, he began life over again. He currently is a columnist with the Bay Area Reporter. In 2017, his column on disability issues was recognized by the National Center on Disability and Journalism at the Walter Cronkite School of Journalism at Arizona State University. “One of the first steps I took in my recovery was to seek insight into my situation,” he said. “I started looking for disability stories that were contemporary in nature.” He didn’t really find anything that fit the bill, so he did the next best thing. “I started turning to people and places that could offer support,” he said. That support eventually led him to pursue a master’s in creative writing, and start a new career as a disability journalist. “Right away when I started working, I began meeting other disabled writers and asked them questions about how they were navigating life,” he said. Their answers are among those featured in the debut title for Oleb Books, a new publishing company Cipriani started up that will exclusively publish writers with disabilities. 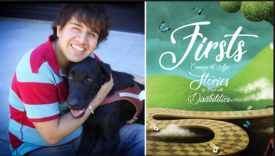 Firsts: Coming of Age Stories by People with Disabilities was released in September. It’s a collection of essays, edited by Cipriani, that describe life with a disability. Also included in the book is Dark Clouds by Nigel David Kelley. He shares how being diagnosed with a slow growing, but debilitating brain tumor helped him discover the important things in life. In Heart in a Bottle, Christina Pieres shares how difficult it is to overcome the assumptions and stereotypes people have about those living with autism. The majority of the book’s essayists developed disabilities later in life. “A common thread in a lot of the stories is that many of the writers were the first person with a disability to do a certain thing,” said Cipriani. Souhrada, for example, was the first deaf child in his community to play t-ball for the local team; the first deaf middle school football player; and the first deaf man in the nation to take a national Spanish test. Another common theme shared by many of the writers, they had a second “Coming of Age” as a result of their disability. “There’s a sense that once you’re disabled your life is over, or it’s less rich. I don’t think that’s the case. All of these people lead very rich lives. They are falling in love, they are getting work, they are moving around. Yes they have experienced tragedy, but they are learning to manage it,” said Cipriani, who hopes the book will serve as a reminder to others that life may not be perfect, but it is manageable. “Great books touch our minds, hearts and take us to undiscovered lands. But for far too long, literary works have failed to capture the disability experience. I’m hoping to change that through Oleb Books,” said Cipriani. His goal is to publish one or two books annually. For more information, go to www.olebbooks.com. 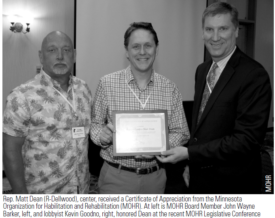 Rep. Matt Dean, R-Dellwood, was recognized by the Minnesota Organization for Habilitation and Rehabilitation (MOHR) with a certificate of appreciation for his years of work in advocating for people with disabilities in the Minnesota Legislature. The certificate was presented at MOHR’s recent Legislative Conference in Alexandria. Longtime disability service providers Rise, Inc. and ESR are hoping to complete a merger in January 2019. Leaders and staff of the two are working to ensure a smooth transition for everyone involved. The merger means that Rise added 155 team members and began serving an additional 500 people when ESR became its subsidiary on July 1. Longtime ESR Executive Director Ed Boeve retired July 1, capping a plus-40-year career in vocational rehabilitation. He is staying on part-time through 2018 to assist with the merger. “Given all the changes in our industry, the leadership and boards of both organizations have concluded that this partnership will result in a stronger combined organization in the future,” said Noren. Two members of ESR’s board of directors joined Rise’s board in June. Susan Langfeldt works for Bremer Bank and lives in Deer Park, Wisc. Kelly Steffens of Prior Lake is corporate counsel with Home Services America. ESR has four locations throughout Washington County, in Forest Lake, Stillwater, Oakdale and Cottage Grove, and one in New Richmond, Wisc. ESR expanded to Wisconsin in 2014. All five locations will remain open, although most administrative functions will move to Rise’s main office in Spring Lake Park by year’s end. Since 1971, Rise has provided employment, housing support, and life enrichment services to people with disabilities and other challenges in the Twin Cities and Greater Minnesota. Rise unlocks potential and opens doors to success through creative solutions and customized support. “Our team members are meeting with community organizations and employers to introduce them to Rise and further solidify the already established partnerships they have had with ESR,” said Noren. “We are confident we will be able to continue to build upon these supporting adults with developmental disabilities and other special needs by helping them integrate into the larger community and gain meaningful employment.